the changes we were trying to bring about were hard, and getting people to change harder still. 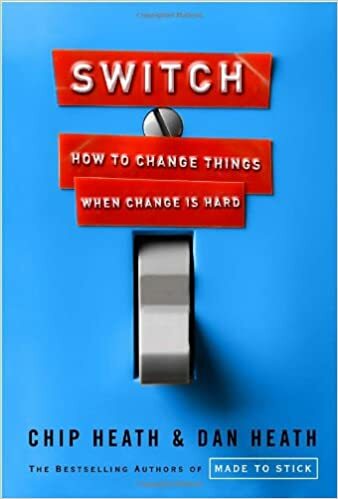 Jose pointed us at some work by Chip & Dan Heath, and suitably armed we set about making the change acceptable by appealing to emotion as well as the rational side of people, and by showing that the change had already started in a way that people were comfortable with. We learned along the way, and we changed our approach. We knew we had to hit time and deliverable milestones, but we changed how we worked as we learned. Recently I’ve been moved to help two other change projects, and suitably armed we’re progressing a bit quicker this time, but still I keep meeting “the old ways”. Q: Where is my project plan for delivering the change plan? A: How can I plan a project when I don’t know what it is going to be? I can come up with a set of activities to find out more, and then review that to create the next set of activities. The important thing is that I manage this to keep us on track to deliver the outcome, in an agreed timescale, then I get to the right outcome. In my head, I’m using soft systems, but outwardly I’m having to translate it to more established approaches. That translating is time consuming and energy sapping, but it gets the job done. People like the results, after all I keep being asked to do this, but they don’t seem to be interested in how they got them. More than ever I believe we need to use Systems Thinking approaches more widely to address our changing world, and I remain hopeful. But I suspect its going to take a lot longer than I had expected and in the meantime it’s keep on with working hard to bridge our different worlds. This entry was posted in Enterprise Architecture, IT, Management, Systems Thinking. Bookmark the permalink.